Guess who’s back. Back again. Jen is back. Tell a friend. Guess who’s back, guess who’s baa, er, um…sorry. I’m just happy to be back in action. It’s been a frustrating couple of weeks but, it looks like the wrist is starting to heal which is definitely a good thing. As some of you know, I had the pleasure of participating in Authors After Dark last week and I wanted to share some of my exploits with you guys. We checked in, or rather we checked our bags in because our room wasn’t ready and decided to roam the city that was going to be our temporary home for the next 4 days. The architecture of the city is pretty stunning. We sought out the closest dim sum restaurant and went to town on some yumminess. After lunch and after killing a couple of hours walking around we checked in and were given a delicious treat. Dudes….the cookie was friggin’ warm. Mmm mmm good. *ahem* We decided to lay low and recharge our batteries for the next day which was filled with panels and a reception later that evening. First panel of the day was Humor in Romance. I figured it was going to be funny. I just didn’t realize exactly how funny it was going to get. Within the first 10 minutes of sitting down ball jokes started flying. *snort* The authors on this panel were Dana Marie Bell, Sahara Kelly, Dakota Cassidy, Ethan Day, Z. A. Maxfield, Alexandra Ivy, Judi Fennell and Robert Roman. Next panel we hit up was Secret Sauce (Authors Tell Their Tips and Tricks). The authors on this panel were Anton Strout, Nicole Peeler, Dakota Cassidy, Nancy Holzner, Carolyn Crane. Although I’m not a writer, I did manage to learn a few tricks that might help me with my posts. This panel was just as funny as the last one but, in a less dirty way. I think we broke for lunch and then hit up the World Building panel. The authors on this panel were Theresa Meyers, Carolyn Crane, Kristen Painter, Stephanie Julian, Stephanie ‘Flash’ Burke and Anton Strout. It was interesting to see how these guys went about building their worlds and what rules they applied to it. They stressed that whatever you decided to create had to follow the rules you set up for it and had to be authentic. After the panel we hit the streets again and did a little shopping. Hello H&M! While traipsing through the city we stumbled upon these cool looking wall murals. Later that evening we attended the host author reception. There were a bunch of tables set up by some cool shops. I got to meet C. J. Henderson and purchased a couple of his books. Aaand that’s it for today folks. 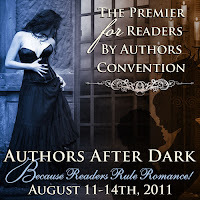 Stay tuned for Part 2 of my Authors After Dark Coverage which should be up tomorrow. Awesome recap! I can't believe (or maybe I can) that you took a picture of the cookies! LOL, Well, they were picture-worthy weren't they? Nice start to the recap of your trip. @Marissa - I thought it would be but, I found it to be pretty laid back compared to Miami. The skyline is quite beautiful. Thanks for stopping by! @Jen - I think it would be awesome if you went. I'll post registration information as soon as I get word. @Smash - Thanks my dear. I'm still trying to devise a plan to take you with me next year. it was so awesome meeting you and our adventures in the airport were amazing! THE COOKIES!!!!! The Secret Sauce panel had me in stitches. So AWESOME to have met you and great recap!!!! @Larissa - Thanks! LOL! Yeah I realized that when I added the photo to the post. I will never forget our crazy airport adventure. @Pam - LOL! They were delicious weren't they?! I'm glad I finally grew a pair and formally introduced myself. Thanks for being awesome! See ya at NOLA?